Living in the great Northwest, I have had the opportunity to visit the Gordon House many times. 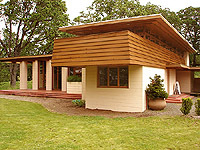 The first was during the Gordon House move to the Oregon Gardens in March 2001, and at the same time the abandoned site. Again in September of 2001 during reconstruction, the grand opening on March 2, 2002 and a number of times since then when I am in the area. Much has been written about the Gordon House since its rescue and relocation. Located in Wilsonville from 1963 until 2001 until it was rescued from destruction and moved to the Oregon Gardens in Silverton, Oregon. Originally designed in 1956 with a budget of $25,000, construction did not begin for seven years, and construction estimates more than doubled to $56,000. 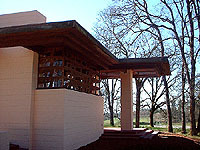 The 2,100-square-foot Gordon House was completed in 1964 and was based on Wright’s "House for a Family of $5-6,000 Income" plan, which was published in a 1938 issue of Life magazine. E. J. Strandberg was the builder. Burton Goodrich, who apprentice with Wright in the 1950s, oversaw the construction. Who would have ventured a guess that nearly forty years later Burton would again supervise the dismantling and reassembling of the Gordon House in Silverton. "House for Mr. and Mrs. C.E. Gordon". This is a poster reproduction of the original drawing for the Gordon's. The occasion was for the saving of the Gordon House from destruction, by relocating it to The Oregon Gardens, Silverton, Oregon. Copyright 2001. Detail from original drawing. Image 4 from May 2007 is a close perspective to the original drawing. Living in the great Northwest, I have had the opportunity to visit the Gordon House many times. There are many classic Wright details. The basic materials are concrete blocks, local cedar and a red concrete floor with radiant heat, designed on a seven foot grid. There are three sets of double wood framed glass doors on the East and West side of the Living Room. They open outward and are one and a half stories tall. 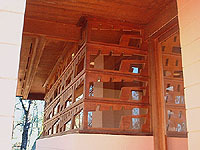 Two cantilevered balconies on the second floor with walls that step inward as they rise. 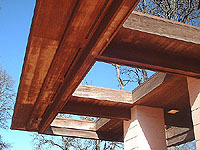 Cantilevered and trellised roof overhangs. Rows of vertical block piers. There are windows with perforated cut-wood light screens. The hidden entrance. Flush vertical joints and raked horizontal joints. The vertical cedar siding is the exact height of the concrete block and lines up with the joints. Saved from destruction. The Move. The original 22 acre site that once was home to the Gordon House, was sold by the Gordon's son in September, 2000. The new owners were not interested in the Home, but the property and slated it for destruction, not knowing it was a Wright home. 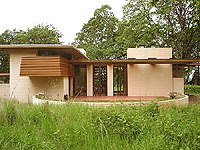 The Frank Lloyd Wright Building Conservancy was notified. Agreements were reached. The interior wood paneling, built-in furniture, doors, cabinets and shelves were carefully removed, packaged and marked to assure an accurate restoration and reassembly. The roof was removed, then the upper story was cut from the lower. The concrete red floor, many of the concrete blocks and interior shower tiles could not be saved. 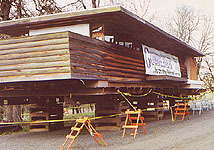 In February and March of 2001 the dismantled Gordon House was moved in pieces, 25 miles away to the Oregon Gardens in Silverton. The building was sited in the exact orientation as the original house. In September of 2001, the reconstructed but incomplete Gordon house was open for public tours. I had the opportunity to visit the original and new site on March 14, 2001, and tour the work in progress on September 16, 2001. 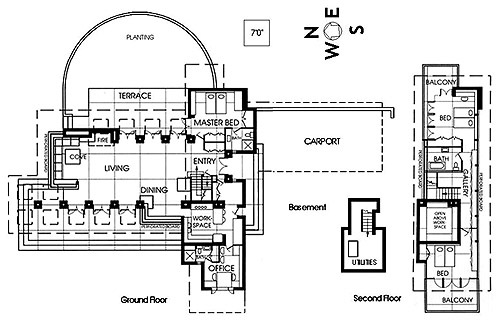 Floor plan copyright 1993, “The Frank Lloyd Wright Companion” Storrer, William Allin, page 451. Edited and Photographed: Futagawa, Yukio, 1990, page 282-283. “The Frank Lloyd Wright Companion”, Storrer, William Allin, 1993, page 451. 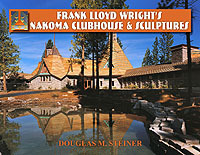 "Frank Lloyd Wright: The Western Work", Legler, Dixie, 1999, page 96-99. "The Vision of Frank Lloyd Wright" Heinz, 2000, page 265, 272. 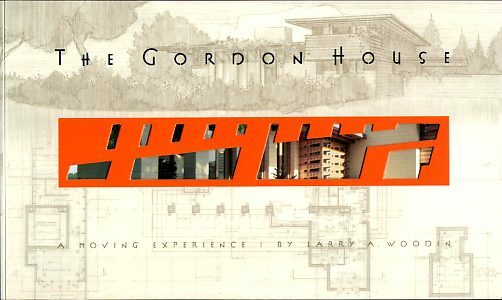 "The Gordon House: A Moving Experience" Woodin, Larry, 2002. 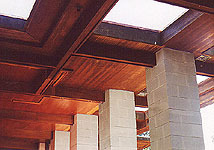 "Frank Lloyd Wright American Master", Weintraub; Smith, 2009, pages 346-347. 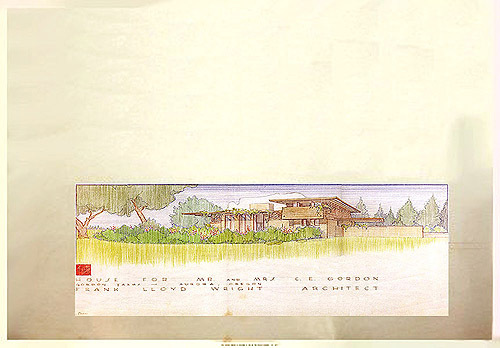 "Frank Lloyd Wright, Complete Works 1943-1959", Pfeiffer; Gossel, 2009, page 454. A) "Saving Wright's Gordon House", by Brian Libby, January 24, 2001. 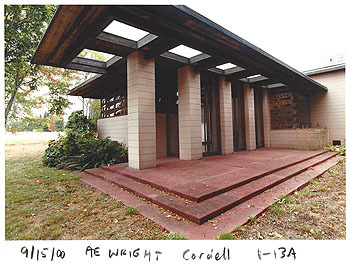 C) "Short Trips: Wright home a tribute to preservation efforts", February 28, 2002, by Jeff Larsen. Title: Conrad and Evelyn Gordon Residence 2000 (1956 - S.419). 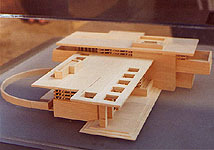 Description: Designed in 1956 by Frank Lloyd Wright, construction did not begin until 1963. Located in Wilsonville from 1963 until 2001 until it was rescued from destruction and moved to the Oregon Gardens in Silverton, Oregon. The original budget of $25,000, doubled to $56,000 because of construction delays. 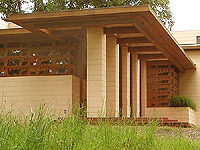 The 2,100-square-foot Gordon House was completed in 1964 and was based on Wright’s "House for a Family of $5-6,000 Income" plan, which was published in a 1938 issue of Life magazine. Photographed before the move. Hand Written on face: "9/15/00, AE Wright, Cordell, 1-13A." 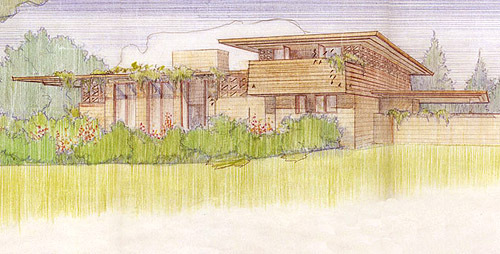 Typed on verso: "House/Home - W (Frank Lloyd Wright, Wilsonville)." Stamped on verso: "Dec 1 2000." Size: Original 10 x 8 color photograph. 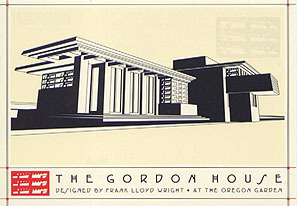 Title: The Gordon House (Produced by The Oregon Gardens). Description: House for Mr. and Mrs. C.E. Gordon. This is a reproduction of the original drawing for the Gordon's, reproduced at 100%. The occasion was for the saving of the Gordon House from destruction, by relocating it to The Oregon Gardens, Silverton, Oregon.